providing research and analysis for educational purposes. 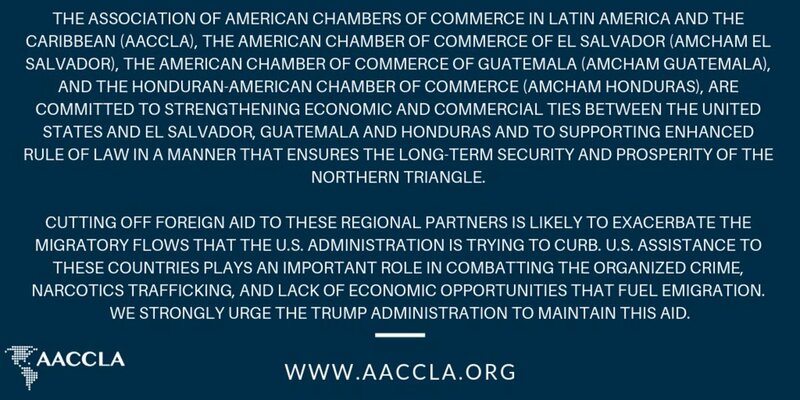 AACCLA forms its policy objectives through constant dialogue with its network of 23 AmChams in almost every country in Latin America. These consultations enable AACCLA to identify the most important issues to U.S. investors and their trading partners and to lobby effectively for policies that will address these concerns. In this section you will find information on policy issues affecting trade and investment in the hemisphere. Ensure AmChams are consistently informed of the ongoing developments in Washington, D.C. as they relate to the region given the current political uncertainty. Ensure greater enforcement is tied to U.S. unilateral programs towards the region, as well as trade agreement implementation. Work with the AmChams to create effective arguments to increase the U.S. Administration’s understanding of the strategic importance of the region. Assist shifting the conversation in the region from one of challenges presented by the U.S. Administration to one of the opportunities that it presents. Promote and support the implementation of the World Trade Organization (WTO) Trade Facilitation Agreement (TFA), including national trade facilitation committees and seek to participate in those committees. Leverage the implementation of the TFA to drive governments to make further reforms in customs processes. Seek to leverage the resources created by the Global Trade Alliance, World Bank, the Americas Business Dialogue, and the Memorandum of Understanding with the Inter-American Development Bank (IDB) to drive forward WTO Trade Facilitation projects and positive trade policy development. Promote the establishment of national dialogues in each country on the implementation of TFA and new eCommerce initiatives, and work to ensure the dialogues include members of the U.S. private sector. Ensure that all advocacy related to IP utilizes and highlights the importance of innovation. Engage the network of AmChams to address some of the issues raised by USTR’s Special 301 Report. Work on creating a seminar that could provide AmChams the capability to self-assess their country and thus add the country to the U.S. Chamber’s International IP Index, which would allow AACCLA to build country-specific innovation fact sheets to help empower finance and trade ministers. Collaborate with AmChams to facilitate roundtables with countries’ patent offices to discuss best practices throughout the region. 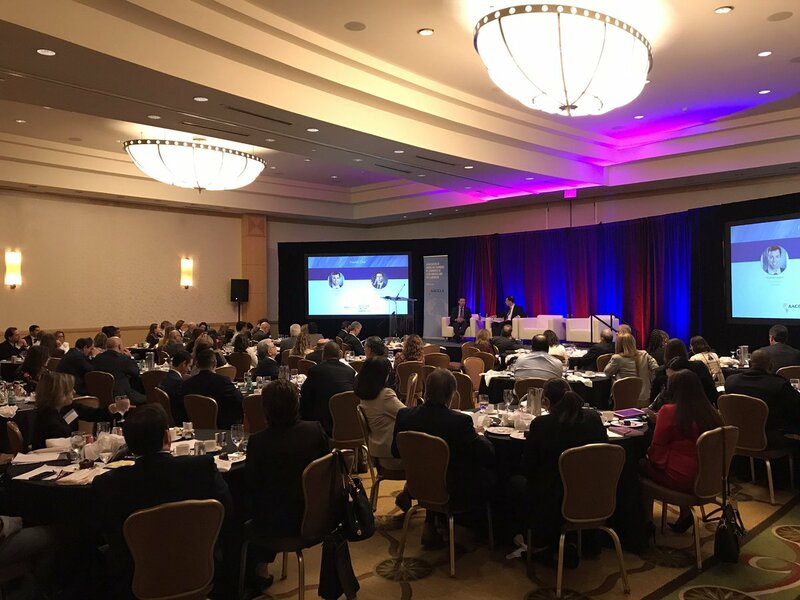 Reinforce the current corporate social responsibility (CSR) work being done in the region by presenting an award during AACCLA’s Forecast on Latin America and the Caribbean conference in Washington, D.C.
Plan the second edition of an AACCLA/AmCham volunteer day. Continue to highlight the work of AmChams in the CSR space through social media and newsletters. Expand the collaboration with International Organizations and other key institutional actors to highlight private sector interests in promoting the rule of law in emerging markets. Work with Leadership Circle companies on distributing the results of the permitting survey with member AmChams and potentially distribute to AmCham members. Continue to ensure that the U.S. Chamber’s Center for Global Regulatory Cooperation and the Chamber’s policy experts are available and responsive to the AmChams as needed. Disseminate the “Implementation Guide” for governments that want to engage in regulatory cooperation with the U.S. Work to create a workshop for the AmChams in this space. Work with Leadership Circle members to create a strategy paper that AmChams can use to effectively engage in the cross-border data flows conversation. Work alongside the AmChams to follow up and implement some of the IP policy recommendations provided by the U.S. Chamber’s Center for Global Regulatory Cooperation during the seminar on Data Protection Best Practices held at our Strategic Planning Retreat. Build on MOU with PAHO Foundation, working with Leadership Circle members to define next steps. Develop an event series that can be replicated in the region that builds greater awareness around building a partnership across sectors and across government. Connect AmChams with local partners FiFarma members in order to assist AmChams in their advocacy.